My headboard is FINALLY COMPLETE! 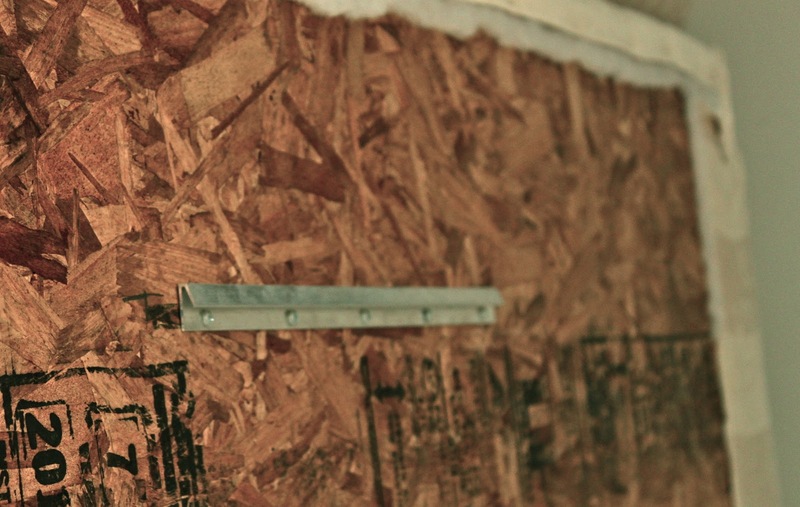 Click if you wanna hear the planning details and the search for all my budget friendly materials cause this post is about the actual construction. Upholstering a piece of wood is easy peasy! 6) Pull fabric tightly on all sides and use staple gun to secure fabric to back of the board- I like to start stapling opposite sides first. Do the corners last and fold them like a present. This is where I got hung up, because I ran out of the nail heads I was using to secure the strips of nail head trim to the board. I could only find three matching boxes at Joanne’s and then they were out of stockforever for over a month. Finally they got them back in and I got Z to get the board back off the wall and could finally get to work. I do NOT usually have project hanging over my head (pun intended) for long periods of time. I’m type A all the way and like to get in and get’em done. Here’s what I started with today. All I needed to do was secure two more sides to the outer row of trim and then the inner row. I found the easiest way to ensure the trim was straight was to set up my laser level to keep a straight line. I couldn’t find any tips online to really straight trim and that lined fabric in NOT forgiving! After getting the laser it really was a piece of cake! A few words to the wise--(1)- If you’re an inpatient person or a little sloppy do NOT buy a striped fabric. You will hate you life- seriously! -(2)-Secure the foam WELL especially if you’re not using trim on the headboard. I could tell my adhesive was coming lose, but fortunately it wasn’t a big deal since I was nailing it all down. -(3)-Wear gloves that trim is SHARP- especially after you trim an edge. I used a French Cleat I found at Lowe’s to attach the headboard to the wall. This is the perfect device to get the job done because they can support a lot of weight and are so easy to install. I purchased 1 large cleat with a 100 pound capacity. It comes in two pieces. It’s a piece of cake to install. Just screw the first half to the wall. I used a drill and a level to get it straight. Then screw the second piece to the back of the headboard (or anything heavy you want to hang) again making sure it’s level. See how big the headboard is? Almost as large as the bed! Anyhow, you should have something like this, 1/2 attached to each piece. Grab someone to help you lift the headboard up above the cleat. See where the cleat juts out from the wall? The cleat on the back of the headboard will slide right into this part on the wall. Even though you could possibly save a couple of bucks hanging it a different way, I love this method. 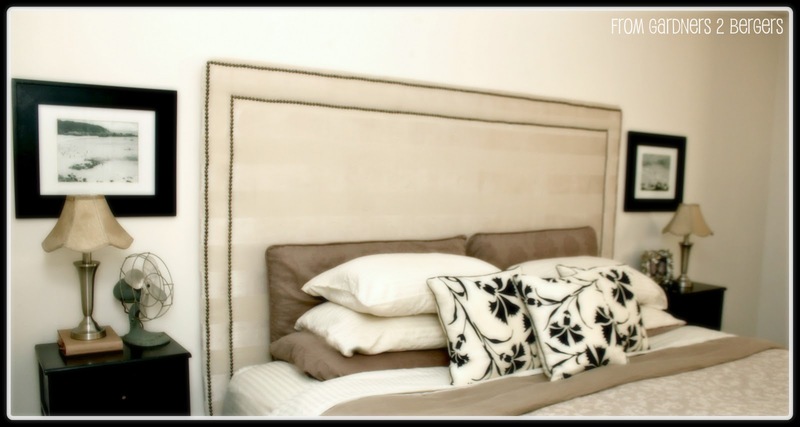 With it you can cheat the headboard a little to the left or right simply by sliding it! We’ve moved the bed a little to the right and a little to the left and haven’t had to rehang the headboard- which rocks! And finally, the finished after! A small piece of advice-Choose your measurements thoughtfully.When I chose the size of my MDF I decided to make a very large headboard. The H 60 x W 78 inches! 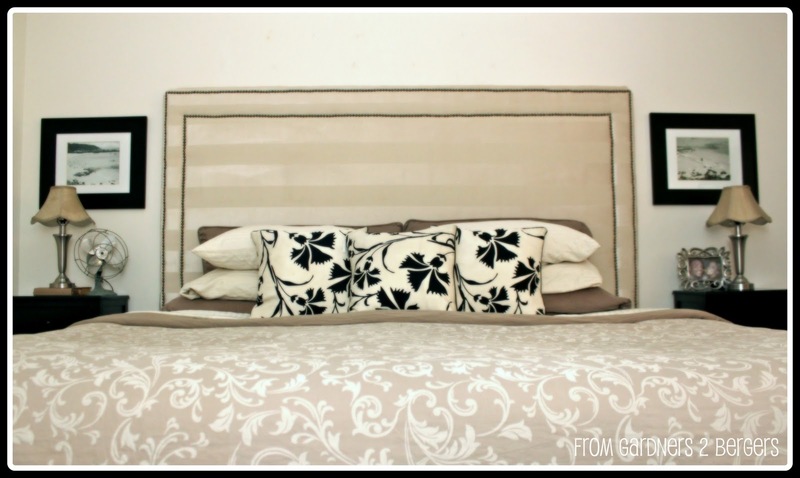 The reason being, I wanted the headboard to show a little on each side of my king size mattress. BUT ALSO- if I ever decide to use this in a guest bedroom with myQUEEN SIZE bed I can FLIP IT and USE IT SIDEWAYS. Pretty sweet, right? 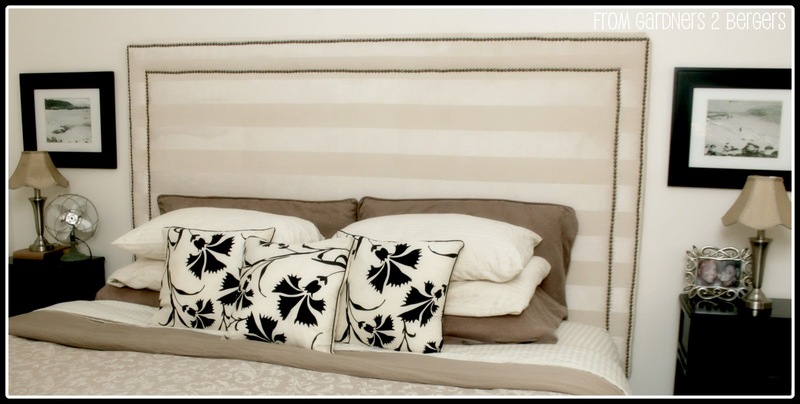 It will be the right width and look very dramatic as 6 1/2 foot tall headboard. Have you seen them- they look fantastic! I also left room and have supplies to finish the trim when I’m ready to change things up. 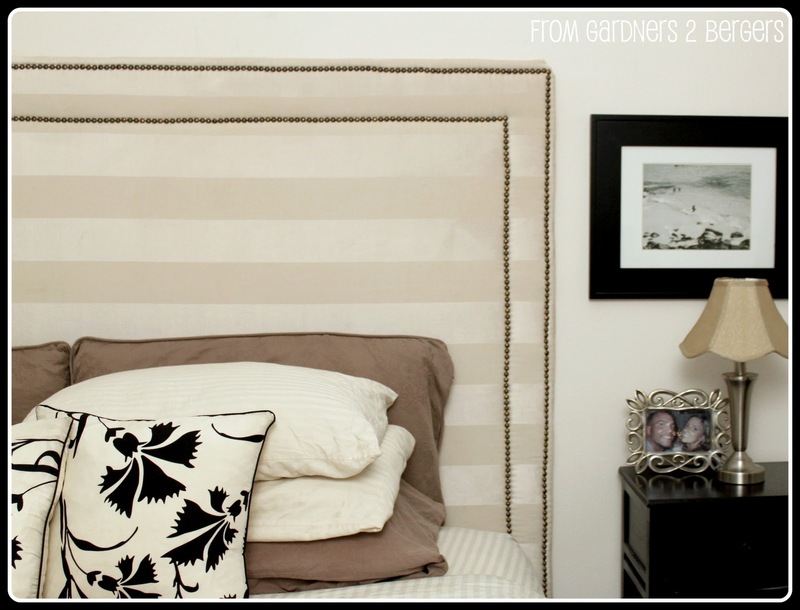 You used to have another headboard tutorial with white cabinets. The link I had doesn’t work anymore and I really wanted to make it! Can you send it to me? Katie, We are having some problems with the transfer, it may take a couple days, but the tutorial should be back, and your link should work. If you don’t see it by Monday would you let me know? I looked at the bottom of the post and it looks like she used about 8 boxes. Depending on the nail head size you could probably calculate the number per foot and try that. I want to try this project. However I have one question. When reviewing your supplies you put nail trim bought on ebay. What did you use nail trim for? How is that different from the nail heads you got ?